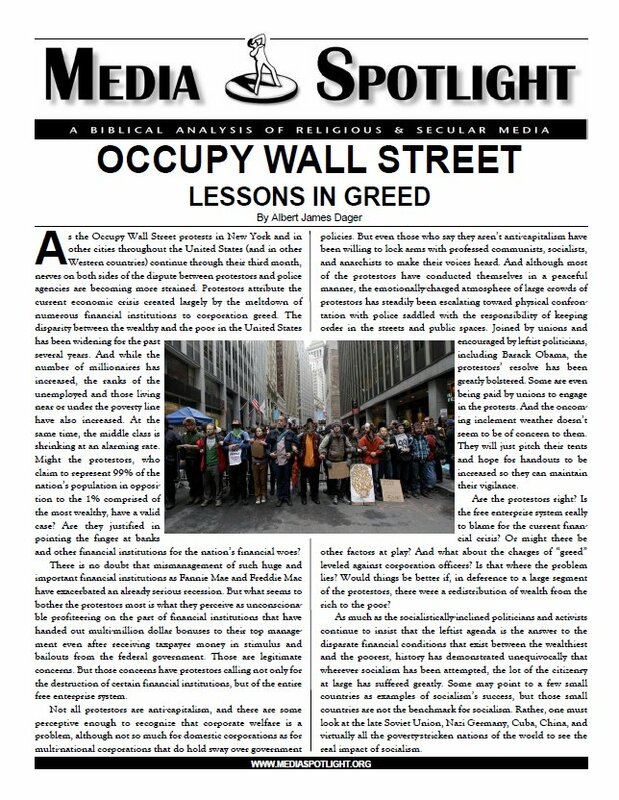 As the Occupy Wall Street protests in New York and inr other cities throughout the United States (and in other Western countries) continue through their third month, nerves on both sides of the dispute between protestors and police agencies are becoming more strained. Protestors attribute the current economic crisis created largely by the meltdown of numerous financial institutions to corporation greed. The logic behind the argument for choice is flawed from the standpoint not only of the Bible, but of science and nature as well. Why is it a crime for a woman to choose to abort her child herself, yet not a crime if she seeks a doctor to do it for her? 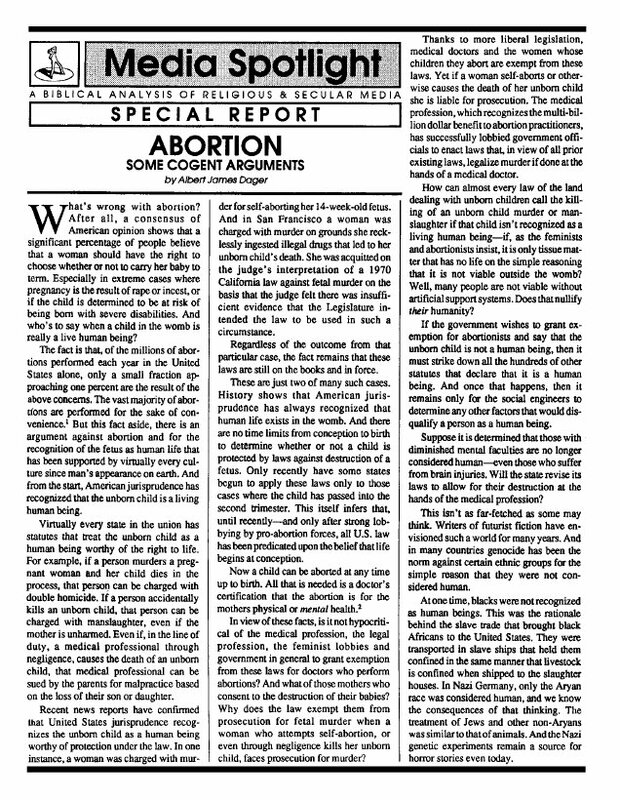 Why is it considered manslaughter or murder (the taking of a life) if one kills a child in the womb, but argued that it is not life if a doctor kills it? The criminal justice system treats all forms of abortion as murder except that committed by a medical doctor. Either it is the taking of life or it isn't. But society wishes to have it both ways. So you thought shepherding was dead? Think again. Those who guided the ill-fated shepherding movement are still working behind the scenes to revive it under a new name, using new tactics. This, too, is another aspect of the dominionist movement that seeks to establish the Kingdom of God on earth without Jesus present. Will you be able to recognize it in your church? 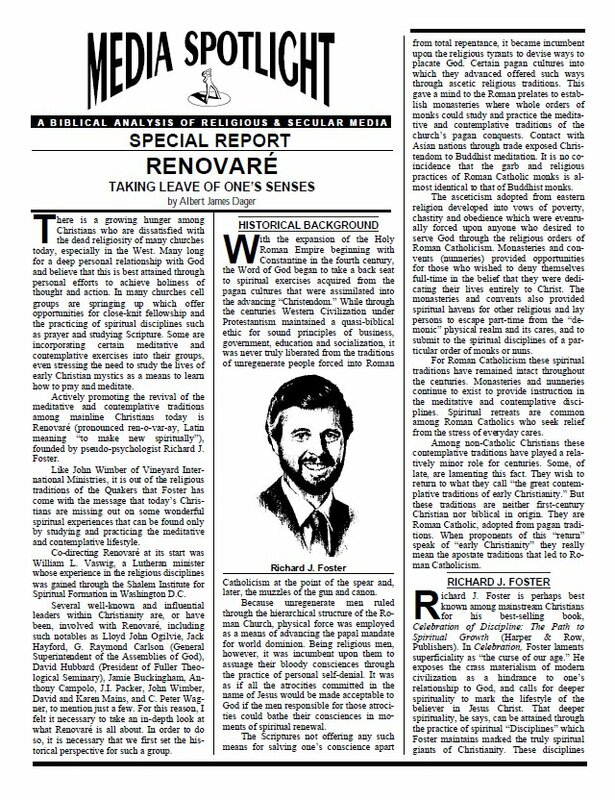 This report may help you. This organization is in the forefront of those melding eastern mysticism and New Age thinking with Christianity. Utilizing meditation, contemplation and other mind-altering techniques, RenovarÃ© seeks to revive ancient so-called "Christian" spirituality that is really Roman Catholic mysticism. Even if you've never heard about this movement, its influence in your church is very likely. 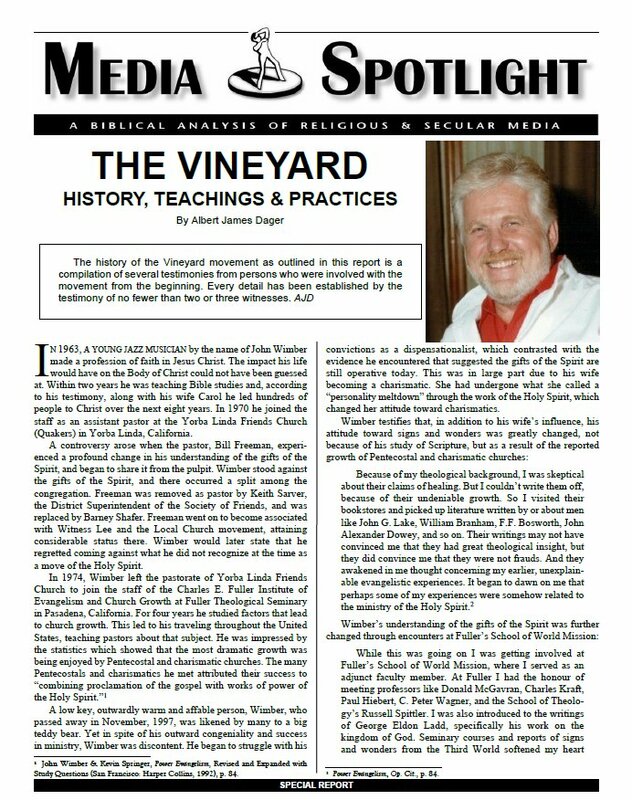 The history of the Vineyard movement as outlined in this report is a compilation of several testimonies from persons who were involved with the Vineyard from the beginning. Every detail has been established by the testimony of no less than two or three witnesses. Learn how the Vineyard incorporates psychological integrationism, New Age spirituality, and Roman Catholic mystical practices in its attempts to do "the stuff." 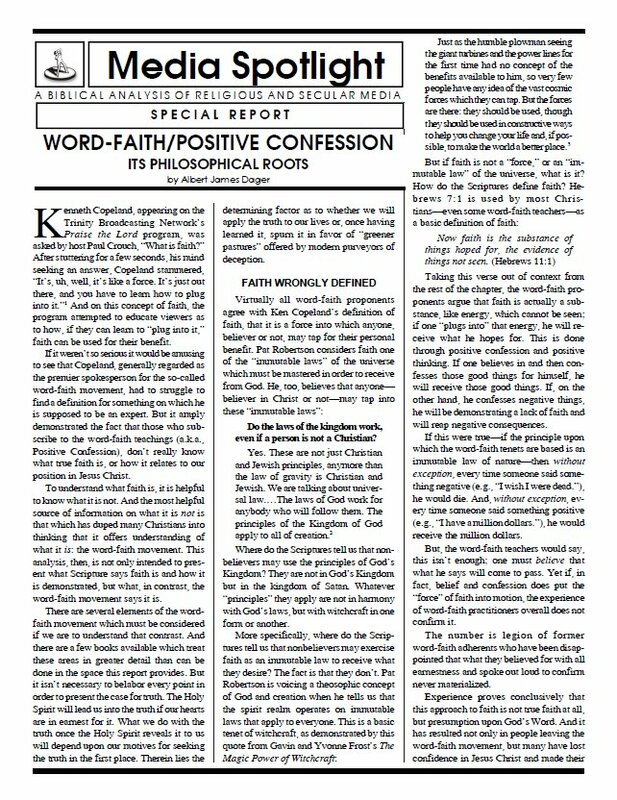 There is really little true faith evident in the so-called word-faith movement. Rather, it is based largely on presumption and wishful thinking. Its proponents are exposed as charlatans who, in reality, deny the blood of Jesus as efficatious for salvation, trusting instead in the Jesus-died-spiritually fable. This fable posits that we are not saved by Jesus' death, but by his allegedly suffering at the hands of Satan in hell. One prominent proponent insists that we are not saved by Jesus' death on the cross because any righteous man could have died for us. Instead, He had to suffer under Satan in order to pay the price for our sins. This effectively denies the blood of Jesus. The ignorance of the word-faith proponents about the Scriptures is appalling. 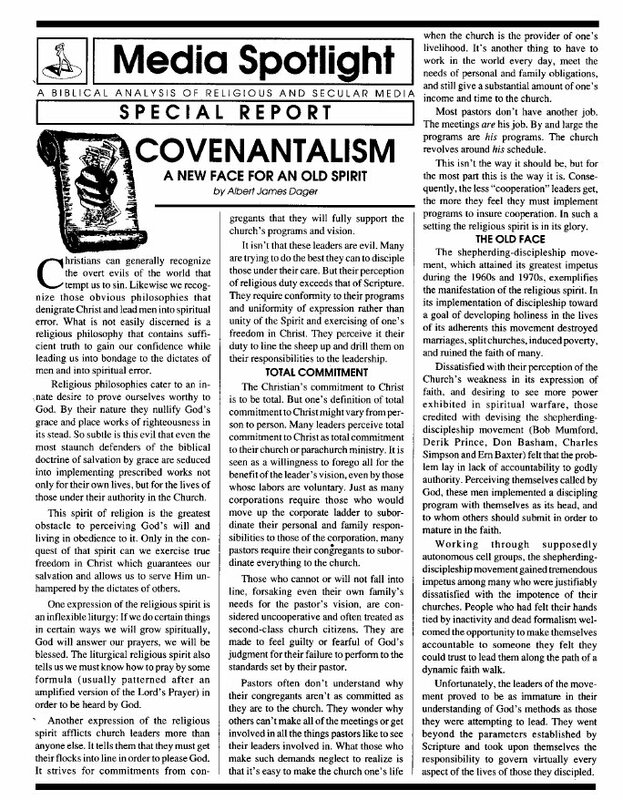 The new spirituality for Americas religious establishment seems to be predicated upon denigrating the white mans God. It has become incumbent upon some leaders within Christianity to impose upon Christians guilt for what unbelieving Europeans did in exploiting other races, as if the Faith itself was culpable. In truth, however, it has been true disciples of the Lord Jesus Christ who have resisted the injustices of all races against others. By pointing the way to Gods Word as the only basis for truth, they have braved the wrath of both sides and, in many cases, have paid the supreme sacrifice of their very lives for doing so..